Here is the trailer from the upcoming film THE HUMANITY BUREAU. The film is directed by Rob W. King. Starring Nicolas Cage, Sarah Lind, Hugh Dillon and Jakob Davies. THE HUMANITY BUREAU hits theaters on APRIL 6, 2018! In the near future climate change has wreaked havoc in parts of the American Midwest. In its attempt to take hold of an economic recession, a government agency called the Humanity Bureau exiles members of society deemed unproductive and banishes them to a colony known as New Eden. 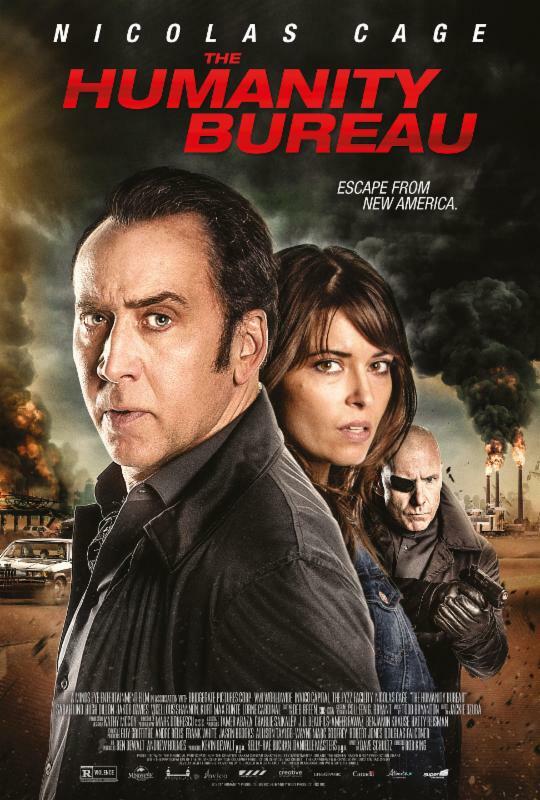 An ambitious and impartial caseworker NOAH KROSS (Nicolas Cage) investigates a case appealed by a single mother RACHEL WELLER (Sarah Lind) and her son LUCAS (Jakob Davies). Knowing the unjust fate of the innocent boy and against the wishes of his superior ADAM WESTINGHOUSE (Hugh Dillon), Kross sets off to save the lives of the mother and child and to expose the truth about the Humanity Bureau’s secrets once and for all. Here is the trailer from the upcoming film “INCONCEIVABLE.” The film is directed by Jonathan Baker, starring Gina Gershon, Faye Dunaway, Nicolas Cage, Nicky Whelan, Natalie Eva Marie. Lionsgate Premiere is releasing INCONCEIVABLE June 30. A mysterious young woman, Katie (Nicky Whelan), and her daughter move to a new town to escape her past and quickly befriends Angela Morgan (Gina Gershon), a mother of one who longs for a bigger family. As their lives become intricately entwined, Angela and her husband, Brian, (Nicolas Cage), invite Katie to live in their guest-house to serve as their nanny. Over time, the blossoming friendship between the two women spirals into a dangerous obsession as Katie becomes overly attached to the Morgans’ daughter. Enduring lies and manipulations, Angela and Brian realize that sweet Katie is actually trying to destroy their family from within. Here is the final trailer from the upcoming film JOE. The film is directed by David Gordon Green, starring Nicolas Cage and Tye Sheridan. Roadside Attractions will release JOE in theaters on April 11, 2014. A gripping mix of friendship, violence and redemption erupts in the contemporary South in this adaptation of Larry Brown’s novel, celebrated at once for its grit and its deeply moving core. Directed by David Gordon Green, JOE film brings Academy Award® winner Nicolas Cage back to his indie roots in the title role as the hard-living, hot-tempered, ex-con Joe Ransom, who is just trying to dodge his instincts for trouble – until he meets a hard-luck kid, (MUD’s Tye Sheridan) who awakens in him a fierce and tender-hearted protector. With a screenplay by Gary Hawkins, JOE is based on the novel by the late Larry Brown (Big Bad Love, Facing the Moon), the former Mississippi firefighter renowned for his powerful, gothic storytelling and universal themes of honor, desperation and moral rectitude. Here is the trailer from Lionsgates’ upcoming film “THE FROZEN GROUND”. The film is directed by Scott Walker, starring Nicolas Cage, John Cusack, Vanessa Hudgens, 50 Cent. THE FROZEN GROUND Opens in Theaters and On Demand August 23, 2013. THE FROZEN GROUND is inspired by the incredible true story that follows Alaskan State Trooper Jack Halcombe (Nicolas Cage) as he sets out to end the murderous rampage of Robert Hansen (John Cusack), a serial killer who has gone unnoticed for 13 years. As the bodies of street girls start to pile up in Anchorage, fear strikes a chord with the public. Risking his life, Halcombe goes on a personal manhunt to find the killer before the next body surfaces. When a seventeen year old escapee (Vanessa Hudgens) reveals key information about the case, Halcombe is finally on the trail of the killer. But will he catch him in time to save the next victim? Here is the trailer from the upcoming film THE CROODS. The movie is directed by Chris Sanders and Kirk DeMicco, starring Nicolas Cage, Ryan Reynolds, Emma Stone, Catherine Keener, Clark Duke, Cloris Leachman. THE CROODS – in theaters March 22, 2013. 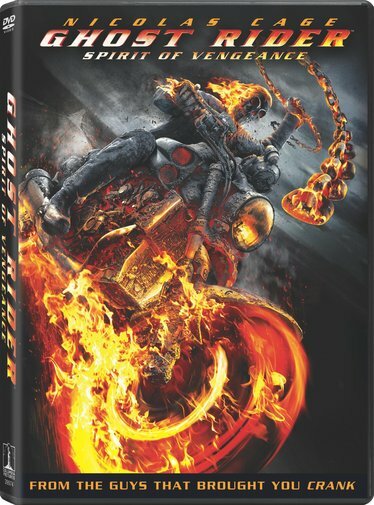 Academy Award® winner Nicolas Cage (1996, Best Actor in a Leading Role for Leaving Las Vegas) is back as Johnny Blaze in Marvel’s action-packed 3D sequel GHOST RIDER: SPIRIT OF VENGEANCE, unleashed June 12th on Blu-ray 3D™, Blu-ray™ and DVD – all with UltraViolet™ – from Sony Pictures Home Entertainment. In this thrilling follow-up to the worldwide, box-office hit Ghost Rider, the world’s darkest hero takes on the ultimate bad guy: the devil, himself. The sequel is directed by acclaimed action filmmakers Mark Neveldine and Brian Taylor (Crank series, Gamer), and co-stars Ciarán Hinds (John Carter, Harry Potter and the Deathly Hallows 2), Violante Placido (The American), Johnny Whitworth (Limitless, 3:10 to Yuma), Christopher Lambert (Highlander, Mortal Kombat), and Idris Elba (Thor, Takers). o The Fires of Hell Will Purify You: Release. Here is the new trailer from Columbia Pictures’s upcoming film, GHOST RIDER: SPIRIT OF VENGEANCE . The Action/Horror is directed by Mark Neveldine, Brian Taylor, starring Nicolas Cage, Fergus Riordan, Ciaran Hinds, Violante Placido, Idris Elba, Johnny Whitworth. GHOST RIDER: SPIRIT OF VENGEANCE – in theaters February 17th, 2012! Here is the trailer from Columbia Pictures’s upcoming film, GHOST RIDER: SPIRIT OF VENGEANCE . The Action/Horror is directed by Nicolas Cage, Fergus Riordan, Ciaran Hinds, Violante Placido, Idris Elba, Johnny Whitworth. The Sorcerer’s Apprentice is just around the corner in preparation of its release, here are few Question and Answer with Nicolas Cage. The Sorcerer’s Apprentice opens in theaters and IMAX July 14, 2010. A: “The Sorcerer’s Apprentice” is a story about a lone wizard, Balthazar Blake, who has been looking for 1,000 years to find the prime Merlinian, the one sorcerer who will inherit Merlin’s power and save the world. Jay Baruchel plays Dave Stutler, who is possibly the prime Merlinian because he’s the only one that can wear the dragon ring. Once Balthazar finds Dave he must groom and train him for his battle against evil. Q: Where did you get the idea for “The Sorcerer’s Apprentice”? A: I had been very interested in the mythology of King Arthur—the legend and lore. I had spent quite a bit of time in England, specifically in that area of Somerset where all the legends developed. Similar to when I was a child reading comic books, I started to get reignited and inspired by reading the stories about King Arthur. And it occurred to me that I wanted to make movies that could resonate that in some way; that would be healing and positive. I wanted to see if I could use magic and the imagination to entertain audiences without facilitating bloodlust and having to resort to violence. At the same time I was doing a picture called “Next” and I was playing a magician of sorts in that movie but I really wanted to play a wizard or sorcerer. Todd Garner was the producer on “Next” and I told him about my idea. Todd said, “I’ve got it. You should be the Sorcerer’s Apprentice from ‘Fantasia.’” Just like that. [SNAPS FINGERS] I thought that’s great. So we started to expand the story and find ways we could lengthen this little eight-minute segment from the Goethe poem in “Fantasia” and make a big two-hour, live-action film. Q: As an actor and an executive producer on this film, can you elaborate a bit on the process of taking your original idea and bringing it to the big screen? A: Well, we pitched it to some writers and got a first draft of the script. Then one thing led to another and we gave it to Jerry Bruckheimer who sparked to it. Jerry has a great way of entertaining people and giving them a big panache of spectacle—a ride. He also has a way of putting things on a fast track. When he liked it, I thought this is great because I know we are going to make a big fun movie for the whole family. Then we brought in Jon Turteltaub. Jon and I worked very well together on “National Treasure” and “National Treasure: Book of Secrets.” Jon has a gift for comedy. He also has a gift for keeping me light and accessible—in the fun zone. Q: As a child did you see the classic Disney animated film “Fantasia”? A: I was very young when I first saw “Fantasia.” I think it may have even been the first movie that my parents took me to see, so it was my first introduction to movies. It was also my first introduction to Disney animation and also my introduction to classical music. The imagery throughout the whole film, not just the Sorcerer’s Apprentice sequence, but the whole film transported me. It influenced my life and everything about it inspired me. I still watch “Fantasia” once a year. I lower the lights, put the movie on and I just sort of lose myself in it. I go into those animated forests and see the little fireflies and mushrooms dancing and it’s just a trip. [LAUGHS] I can’t help but love it. Q: Although “The Sorcerer’s Apprentice” is not a remake of the classic Disney film, audiences may initially associate it with “Fantasia.” Did you keep this in mind when making the film and did you feel any pressure? A: Some people have asked me if I was nervous because we were tampering with a Disney classic. I wasn’t. We made a film I think Walt would approve of and I believe that I was in the right place at the right time to make this movie in my life and to make it in such a way where I have faith in it. I don’t really have any expectations other than that I hope to make some children smile. That’s the best way I can apply my abilities as an actor. Q: Please briefly describe your character, Balthazar Blake. A: Balthazar is a character that goes all the way back to 500 A.D. He was there with Merlin as well as with Alfred Molina’s character, Maxim Horvath, and Monica Bellucci’s character, Veronica. At the beginning, all three of us were Merlin’s apprentices. Also at that time, Morgana has rebelled and decided to use magic for selfish gain. So we, the Merlinians, decide to protect mankind from the Morganians. We use the magic to empower mankind and keep them from being enslaved. When Merlin dies, it is Balthazar’s job to find the prime Merlinian, the next sorcerer who is the inheritor of Merlin’s power. Balthazar searches for 1,000 years before finding Jay Baruchel’s character, Dave Stutler. Dave may possibly be the prime Merlinian because he’s the only one that can wear the dragon ring. Once Balthazar finds Dave he must groom and train him for his battle against evil. So Balthazar Blake may look a little spooky at times, but he’s definitely on the good side. Q: Can you expand a bit on the tricky relationship between your character, Balthazar Blake, and Jay Baruchel’s character, Dave Stutler? A: The relationship between Balthazar and Dave is almost like a paternal one. I care about him because I’m out there all on my own trying to stop evil forces from taking over. So when I find him, it’s with great affection and it’s an enormous relief because I have found the prime Merlinian. I want to guide him; I want to instruct him and train him for a larger purpose. But it is very overwhelming for Dave and he doesn’t quite know how to take it. Imagine if someone walked into your life and said that you are the descendent of Merlin, you have all this power and you are destined to save the world. You are going to tell the guy that he is nuts. So it is a very complicated relationship, but there is a lot of comedy coming out of it particularly as Dave begins to deal with this completely preposterous information. Q: Alfred Molina plays Maxim Horvath who is Balthazar’s arch-nemesis in the film. Describe for us Maxim’s character. A: Maxim Horvath was originally a Merlinian and was Balthazar’s best friend, but Maxim has turned to the other side because of jealousy. He is now trying to aid Morgana in taking over the world and enslaving mankind. Balthazar is trying to prevent that from happening. So Maxim’s relationship with Balthazar is this constant battle that’s been going on for 1,000 years. Q: What are some of the challenges that Balthazar and Dave face in the film? A: In the movie there is this marvelous invention called the Grimhold, which is a prison for very scary and wicked Morganians. The Grimhold looks like a Russian nesting doll—those sets of wooden dolls that decrease in size and are placed one inside the other. The more evil the Morganian, the deeper they go into the different sizes of the Russian doll. Dave and Balthazar are trying to retrieve the Grimhold and keep it from getting lost because every time it gets taken Maxim Horvath has the ability to open it and release this very dangerous and evil force. Q: Why did filmmakers decide to shoot “The Sorcerer’s Apprentice” in New York City? A: It feels like everything comes in and comes out of New York City. It’s like an epicenter of sorts to the world. New York was one of the thirteen original colonies. When the pilgrims came here on the Mayflower, this was one of the first destinations. So you still feel some sense of history and some destiny of culture. And then you have a very uniquely American style of art deco architecture that is in the midst of it with the Chrysler building and the Empire State Building. There is also a mysterious and gothic side to the city. When you think about all the classic movies that have been made here such as “King Kong,” it is impossible not to be overwhelmed and inspired by New York City as a magical backdrop. So it would be the first place I would imagine where a sorcerer war would be going down. Q: What is the secret to your successful working relationship with Jerry Bruckheimer? A: This is my seventh movie with Jerry, so we have a comfort level together. He has his process and he understands my sort of algebraic addition to the process—the X factor, if you will. I trust that Jerry will make movies that will be entertaining for people because that is his priority. And he trusts that I will come up with the X-factor that will somehow make sense of it all in terms of the character and will fit within the narrative. I think that’s why he hires actors with an alternative point of view, because it does add an extra dimension to his formula. So it is a happy marriage where there is a shorthand. I know how he works and vice versa. Q: “The Sorcerer’s Apprentice” is the third time you have collaborated with director Jon Turteltaub. Can you describe your working relationship? A: Jon is very good with comedy and he knows how to get humor out of a scene. I have an interest in the darker and more edgy things, so Jon looks to me to go into more of the mystical aspect of the character and I look to him to help bring in more of the comedy that can connect with audiences. So it’s a good mix and we balance each other out. Q: You and Jay Baruchel seem to have a great chemistry on screen. What was your working relationship like during production? A: I just think he is hilarious and I think he is incredibly smart and well-read. You can ask him a question about any subject and he will have an answer for you. He will attach it to something else and you will learn from it. I love that kind of mind. So I think there was this genuine mutual respect and appreciation on both our parts. We would go to work with this sense of delight that we were going to improvise and that would only add to the creativity of the scene. A lot of actors don’t like it when you improvise. They are out of their comfort zone and would prefer to stick to the script. For Jay improvisation is a huge part of his presentation in films, as it is in mine, so it was a chance to achieve a jazz type of performance in the true sense of the word in that I had another musician to work and riff with. Q: What was it like to work with Alfred Molina who plays the villain Maxim Horvath? A: I have been a fan of Alfred Molina and he is someone I have admired for many years. I am thrilled that he’s playing Maxim Horvath because he can bring so much mischief and playfulness to the role of any villain. German film director Werner Herzog calls it “the bliss of evil.” I think Alfred really portrays that well. He seems like he’s enjoying himself so much when people are in trouble. And he has a wicked sense of humor. He is really the right guy for the part and I am glad I could finally work with him. Q: As a child did you believe in magic? Q: There are some amazing visual effects in “The Sorcerer’s Apprentice.” Did you find that aspect of the production challenging? A: I do not find acting with visual effects difficult because it’s not any different than being a child in your backyard pretending that you’re sitting in the cockpit of a spaceship or pretending you are in battle with Excalibur in your hand. I did all that. I just imagined it. And that’s what acting is; it’s just imagination. I get it when I hear other actors complain. They are saying that you don’t have the actual person to listen to and I do understand. There is truth in it. But at the same time I also believe that if you can get yourself into an imaginary state in such a way that it is visceral enough, you will have no problem making it come to life for you. Q: Why does Balthazar drive a rare 1935 Rolls-Royce Phantom in the film? A: We came up with the idea that Balthazar should have that particular Rolls-Royce because the Rolls-Royce factory developed the Merlin engine that was also in the Spitfire airplanes that defeated the Nazis in World War II. Many cars have won the Grand Prix, but only one had ever stopped a war. So for me, it was a perfect addition to the movie because it showed the concept of Merlinians at work; behind the scenes protecting mankind and how they are present even though we are not aware of it.